Since its introduction in 2008, Furio has revolutionized not only studio robotics, but also the way broadcast news is produced. With the ability to produce silky smooth, sweeping on-air dolly shots, which can then be precisely repeated over and over again at the push of a button, Furio allows broadcasters to create more dynamic looks – while also delivering higher quality and repeatability, and lowering operating costs. Unlike jibs or other specialty camera systems, Furio has the capacity to support full-sized cameras and teleprompters, giving it the flexibility to deliver spectacular beauty shots, while also serving as the primary production camera. As a modular system, Furio is available in a wide variety of configurations, with multiple platforms, lifts and heads to choose from. Select the towering height and unbeatable range of the SE 3-stage lift, the more economical S2 2-stage lift, or a fixed column – or mount the head directly on the SE dolly. System can then be paired with either a VR100 or VR600 pan and tilt head, depending on payload requirements. Delivers superior performance in multiple applications, combining speed and height with power and payload capacity, to provide the highest performing, most flexible and versatile rail-based camera system available. Designed with virtual and augmented reality in mind, Furio can be combined with other Ross systems to provide the security of a simple and dependable virtual solution from a single supplier. Creates distinctive shots with more fluid and dramatic visuals that make productions come to life, capturing and holding audience attention. Incorporates eye-catching aesthetics that provide a cutting-edge look to programs, not only behind camera, but also in front of it. Furio SE Dolly runs on a compact 36 cm (14”)-wide track, requiring less space than a manual camera and operator, making it ideally suited for small studios where space is at a premium. Communicates natively over IP, using a flexible and open API, that makes it a perfect fit for studio automation, whether in combination with Ross OverDrive, or other major third-party systems. Looking for a Remote Camera? Furio Live is perfect for capturing all the action at live events! All Furio Studio systems have the payload capacity to support a teleprompter, allowing them to be much more than just a specialty camera. All Furios provide stable and accurate virtual tracking data, making Furio the perfect tool for Virtual and Augmented Reality. Integrated diagnostics, fault tolerant circuits, and field replaceable electronics modules make Furio SE even easier to operate and maintain. Fewer exposed components, embedded linear rail technology, and advanced carbon fiber construction ensure long-term reliability and performance. 100% designed, manufactured and installed by Ross Video. No third party OEMs. Backed by Ross’ legendary global support with lifetime phone and email support – no contract needed. Remote and on-board E-stops combine with regenerative brakes to ensure the system is quickly and safely brought to a halt in case of emergency, while anti-tip features on wheel assemblies ensure the dolly cannot derail. The Furio SE dolly combines high performance, usability and safety in an eye-catching package. Quick around the tracks, intelligent cabling and interconnect features make it quick to setup, while full-featured, field replaceable electronics modules make it easy to maintain. 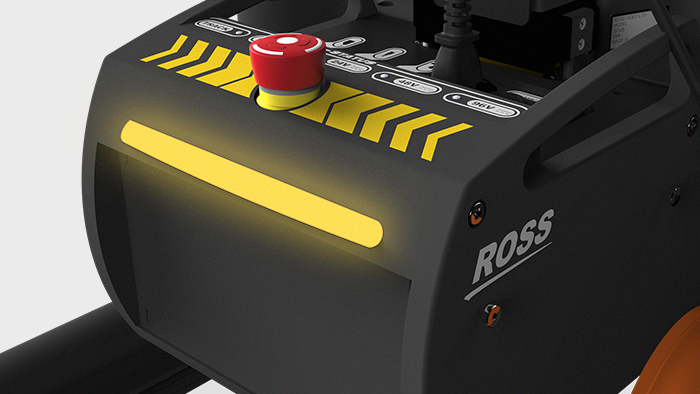 Front and rear E-stops, regenerative brakes, and motion indicator lights make it the safest dolly on the market. Mounting a VR100 or VR600 head directly on the dolly provides a unique perspective, whether looking up from floor level, or down from a mezzanine. 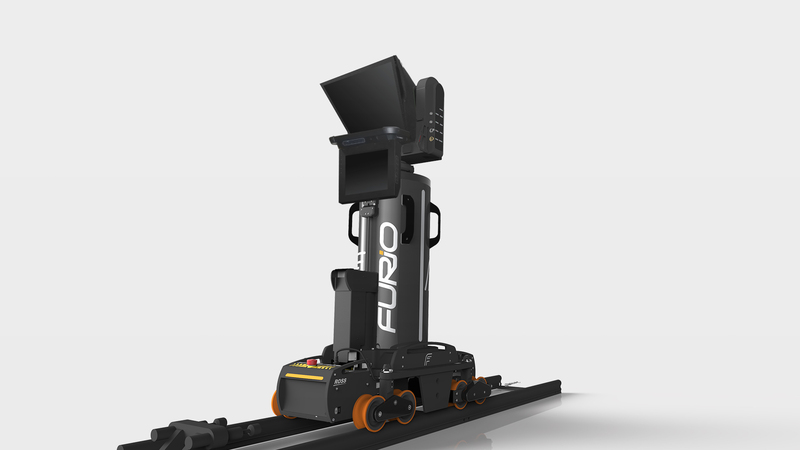 Already a market leader as the only mass-produced, high performance robotic dolly system available, the Furio lift and dolly were completely redesigned in 2017 when Furio SE was introduced. 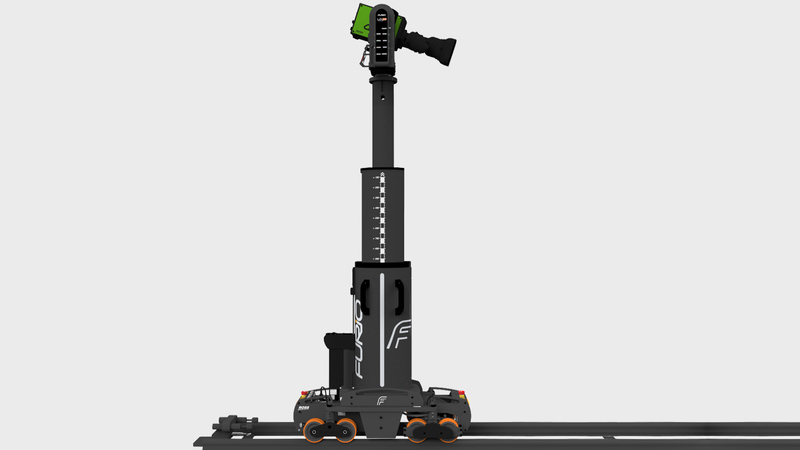 At over 2.2 m (7′ 2″) tall, and with more range and speed than the original, the SE Lift combines with the SE dolly to provide spectacular moving shots, while safer, more robust and more reliable than any competing system. Meanwhile, its intelligent design makes it easier to setup, maintain, and operate. With the addition of the economical S2 Lift, the Furio lineup now includes a more affordable option that will enable an even wider spectrum of studios to enjoy the practical and creative benefits that have made Furio so successful. Combine with a VR100 (1777mm/70.0″ height) or VR600 head (1808mm / 71.2″ height) and the SE dolly to create a high-performance dolly system at a mid-market price.